CHELMSFORD, Mass. – September 12, 2013 – Axis Communications, the world leader in network video, today announces two cost-effective additions to its line of video encoders that have been developed to meet the needs of small- to medium-sized surveillance installations. Offering full frame rate video, AXIS M7016 Video Encoder provides an attractive, cost-effective and easy entry to network video, while the flexible AXIS P7216 Video Encoder adds audio and I/O ports and is equipped with a small form-factor pluggable (SFP) slot for use with fiber optics. 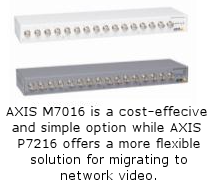 Unlike many encoder solutions that require four network ports per 16-channel unit, AXIS M7016 and AXIS P7216 Video Encoders utilize one single network port, which helps drive down overall cost and port density of the surveillance system infrastructure. Both AXIS M7016 and AXIS P7216 come with a power supply, offer simultaneous H.264 and Motion JPEG streams and include four micro SD-card slots supporting up to 64 GB (cards not included). Additionally, AXIS P7216 features a separate Ethernet service port to allow direct connection for maintenance and configuration, while its SFP slot offers network redundancy by automatically switching traffic over to the Ethernet port if the SFP module fails. The video encoders join a product portfolio that has expanded to include solutions for systems of all sizes. The recently announced AXIS Q7436 Video Encoder Blade and complementary AXIS Q7920 Video Encoder Chassis create a high-performance solution for large-scale, mission-critical applications. Axis also recently claimed the number one spot globally in the video encoder category for 2012 according to a report from information and analytics firm IHS. AXIS M7016 and AXIS P7216 are supported by AXIS Camera Station video management software as well as the industry’s largest base of application software through the Axis Application Development Partner (ADP) program. Furthermore the video encoders support AXIS Camera Companion, Hosted Video and ONVIF for easy system integration. The new 16-channel encoders are planned to be available to order in Q4 2013 through Axis’ standard distribution channels at the suggested retail prices of $1299 for AXIS M7016 ($81 per channel) and $1599 for AXIS P7216 ($100 per channel). Affordable surveillance kits including the encoders and 16 licenses of AXIS Camera Station will also be made available for $1499 and $1799, respectively.